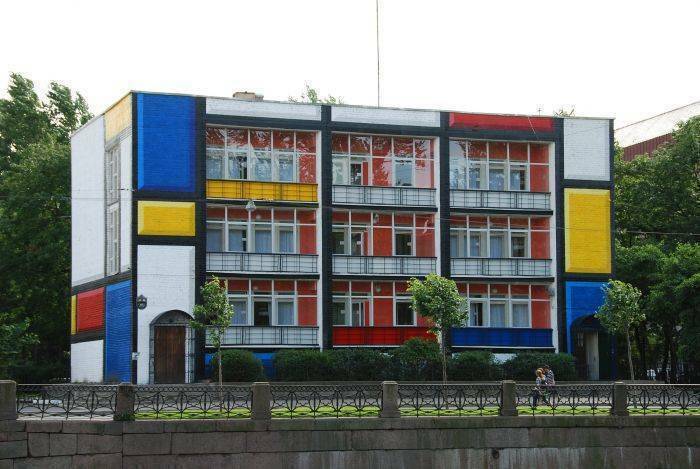 Graffiti Hostel is located in a freestanding four-storey building on the embankment of the River Moika. The green outer court round the hostel building is surrounded by a high metal railing to ensure the guests can rest peacefully and comfortably. There is a well-developed transport infrastructure around the hostel, a lot of stores, cafes, and restaurants. The Hostel has a convenient parking for cars and buses. Graffiti Hostel can accommodate 156 guests. The guests are offered rooms for 2, 4, 8, and 12 people. The design of the rooms in Graffiti Hostel is colourful, present-day, and they are painted in an ultramodern range of colours. Guests can enjoy free Internet and Wi-Fi access throughout the Hostel. 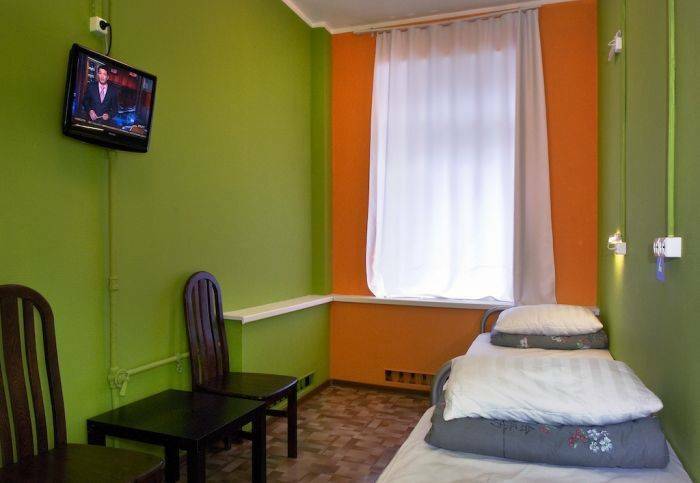 Graffiti Hostel offers convenient, modern accommodation in St. Petersburg at budget prices. 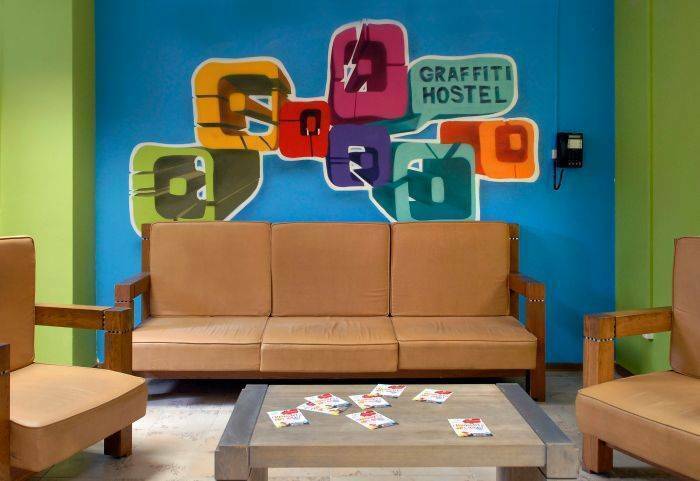 Graffiti Hostel has colourfully up to date designed dorms and public areas, painted in an ultramodern range of colours. Peach, white, red, black, orange, silver, and pistachio green colours create an exceptional atmosphere of joy and comfort for our guests. 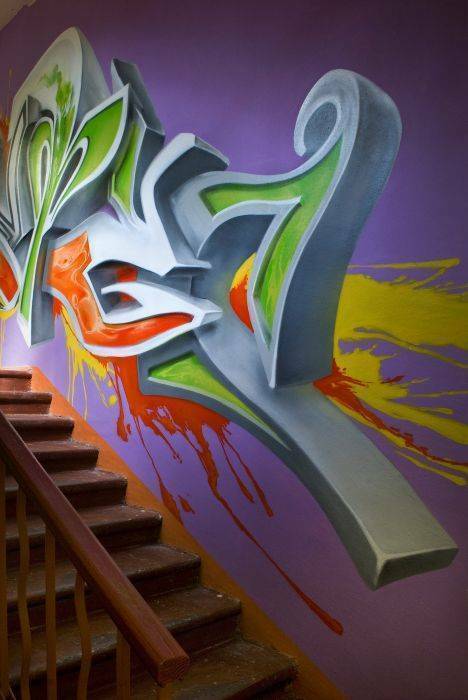 The lobby and stairs are decorated with a unique individual decorative artistic painting, known as graffiti. This style, so popular today, will not leave you indifferent. This is worth seeing and appreciating! Graffiti Hostel is a freestanding four-storey building. 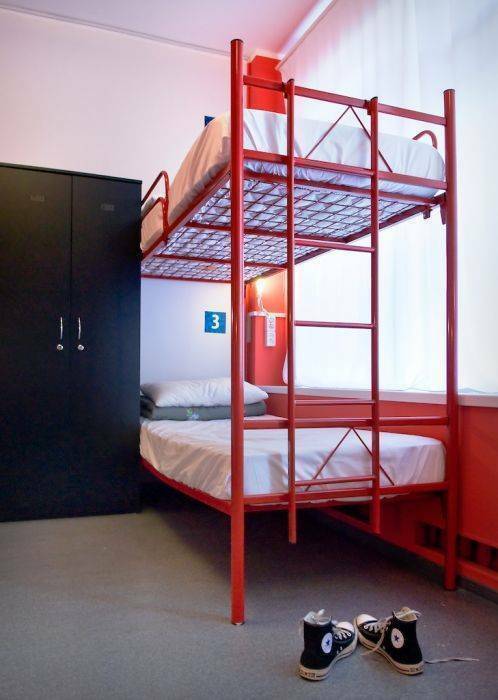 The hostel has are 156 beds. The guests are offered rooms for 2, 4, 8, and 12 people. The rooms are located on all four floors. There is no elevator in the building. The toilets can be found on each floor and the shower area is on the ground floor. Every room has top quality two-tier bunks, a set of bed-linen with a towel, lockers for clothes, double-glazed windows and free Wi-Fi access. Each bed is equipped with an individual light fitting. Double rooms also have a TV. During your stay you are welcome to use the kitchen with all the equipment (fridge/freezer, heater, frying pans, cutlery, etc.) whenever you want. For extra payment you can get bathroom towel, slippers, dresser set, telephone cards, laundry, PC use, visa support. Also you can hire fan & iron if needed. Hostel Guests can leave their luggage in custody of the Hostel. It is advised that all valuables should be left in a safe - this service is free of charge. The Hostel is located in the historical centre of St. Petersburg at 102 Nab. Reki Moiki opposite New Holland Island. Such architectural and cultural monuments as the famous New Holland Arch, the city's most renowned theatre, the Mariinsky, the Music Conservatory, St. Isaac's Cathedral, Nikolaevskiy Palace, St. Nicholas Naval Cathedral, and Potseluev Bridge, are all close to the Hostel. Despite the richness and variety of cultural life in this district of the city, Graffiti Hostel is located in a quiet and calm place, the main roads lying 300 meters away. From Pulkovo Airport: K-39 or bus #39 - till Plochad Pobedi, then by bus #3 (recommended - goes through the city & the whole Nevsky prospect) or by K350 - both till Potseluev Bridge. From Sadovaya Metro Station: K-1, K-186 or K-350 - till Teatralnaya Pl. From Nevsky Prospect Metro Station: bus #3, #22 and #27 - till Potseluev Bridge. From railway station Moskovsky Vokzal: bus #3, #22 or #27 - till Potseluev Bridge.